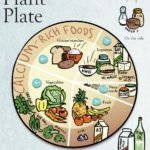 Use the Plant Plate to make food choices that ensure you’re meeting nutrient needs on your vegan diet. 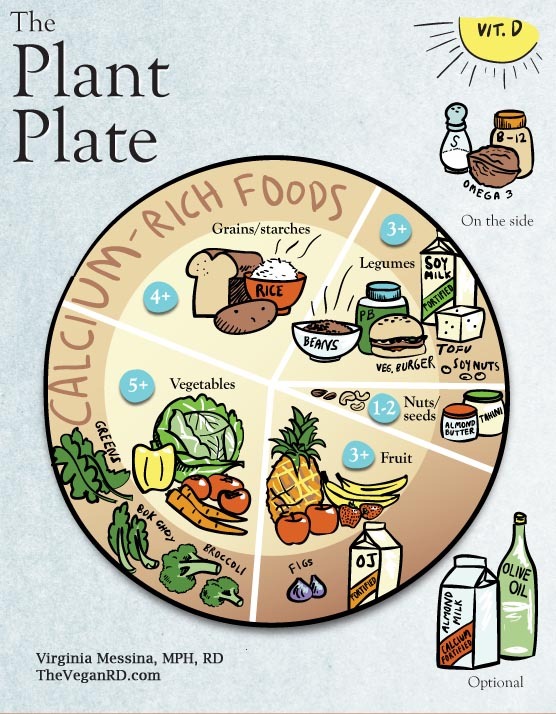 Because calcium foods are everywhere in this guide, there is no “calcium group.” Instead, calcium-rich foods from each group appear on the perimeter of the plate. As you make your choices from the Plant Plate groups, make sure you’re including plenty of these foods from the perimeter. I’ve also included an optional group of plant milks made from almonds, hempseed, coconut and rice. These foods—unlike soymilk, which is a legume—are generally low in nutrition and don’t really fit into any of the food groups. But, because most are fortified with calcium, these milks provide excellent ways to help you meet calcium needs. Hempseed milk has the additional advantage of providing some of the essential omega-3 fatty acid ALA.
You’ll see a few other items on the side of the plate—a little shake of iodized salt, a B12 supplement, and a reminder to make sure you’re meeting needs for ALA, the essential fatty acid. Add a vitamin D supplement if you aren’t getting adequate sunshine. Finally, vegetable oils are another optional menu choice. You don’t need them in your diet, but it’s fine to include them if you wish. 1. Eat legumes—at least 3 servings per day, or at least 4 servings if you are over 50 years of age. 3. Emphasize whole grains over refined, and if you like them, include some whole grain bread and some sprouted grains in meals. 4. Include healthy higher-fat foods like nuts. Make sure you’re getting enough of the essential fat ALA by including flaxseeds, walnuts, or one of the vegetable oils that provides this nutrient and consider an algae-derived supplement of DHA/EPA. 5. Make sure you are getting plenty of calcium by choosing leafy green vegetables, calcium-set tofu, soynuts, tempeh, fortified plant milks or yogurt, fortified juice, dried figs, almonds, or tahini. 6. Don’t shun supplements. You absolutely need to take a supplement of vitamin B12 unless you are certain that your diet contains enough from fortified foods. Sea vegetables and fermented foods are not a reliable source of this nutrient. If you don’t get adequate sun exposure, take a vitamin D supplement. And, if you don’t use a few shakes of iodized salt on your food every day, a supplement of iodine can be a good idea. 7. Keep the focus on whole plant foods, but don’t get too obsessive about this. Gently processed foods can be helpful for meeting nutrient needs and they can make your healthy vegan diet easier to stick with for the long term.